My granddaughter’s birthday is October 28th so we decided to have a Halloween birthday party. I baked a 13×9 vanilla cake and frosted it with chocolate fudge frosting. I added a pumpkin patch with candy pumpkins and green butter cream frosting. I made cookie tombstones and a graveyard fence by dipping pretzels in melted chocolate and shaping them into a broken down fence. I also baked a chocolate house shaped cake using Wilton’s house pan which I frosted with purple, black and orange butter cream and added cobwebs and marshmallow ghosts. 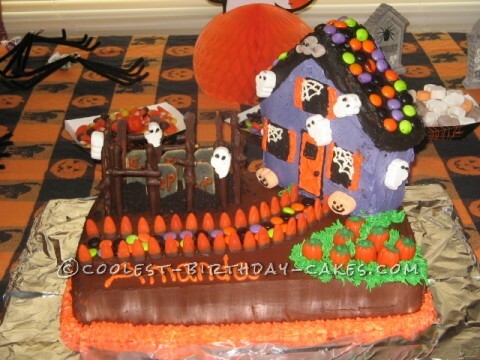 Using wooden dowels, I placed the house cake on one end of the flat cake and added a walkway of Halloween M&M’s and candy corn. Everyone loved the cake and didn’t want to cut it and my granddaughter was very happy with her birthday cake. that is shuch a good idea i mite do that for my daughters 10th birthday but thank you for the idea !!!!!!!!!!!!!!!!!!!!!!!!!!!!! !